Wicking garments have become the standard in performance apparel, designed to distribute moisture evenly to allow for quicker drying. But they fall short when extremities become saturated with moisture. 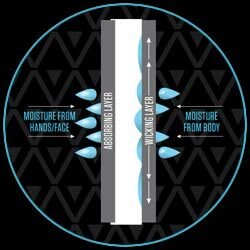 DRYV Technology integrates an absorbent outer layer allowing the body fabric to wick, while providing a surface area to keep hands and face dry. All DRYV fabrics are subject to rigorous testing standards through our partner lab at the Clemson University Apparel Sciences Testing facility. Body fabrics are tested for vertical wicking using AATCC Test Method 197 and horizontal wicking using AATCC Test Method 198 to achieve a minimum acceptable standard of wicking rates. Exterior fabrics used for wipe zones are tested for absorption using AATCC Test Method 79 for speed of moisture absorption and AATCC Test Method 200 to determine the drying rate of fabrics once they reach absorbent capacity. 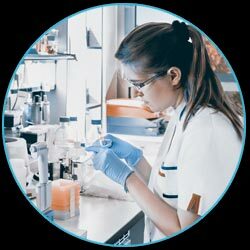 Once wicking and absorbing fabric samples have been paired together, garments are tested for compatible stretch and tear strength according to ASTM D6614 and ASTM D2261. Pairing fabrics together with inherently different properties allows each to perform its intended function more efficiently. 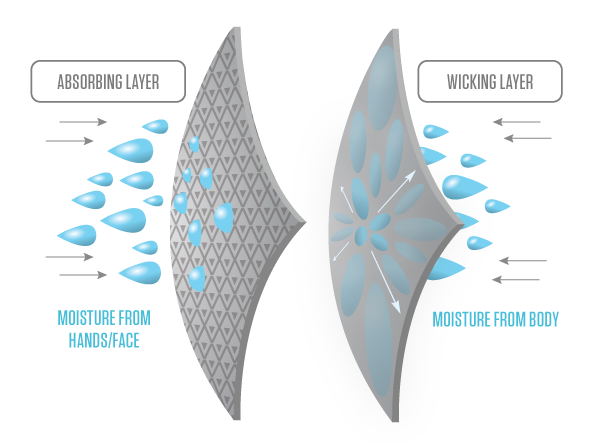 Excess moisture that does not dry completely when in contact with wicking body fabric is absorbed by the garment’s exterior surface area. Conversely, should moisture exceed the absorbent capacity of the exterior “wipe zone”, it is wicked before reaching the wearer’s body, keeping the garment dry and ready to perform. HOW CAN WE DRYV YOUR GROWTH? DRYV Technology is the future of performance apparel. Learn more about how to integrate the next great textile innovation into garments designed for work and play.